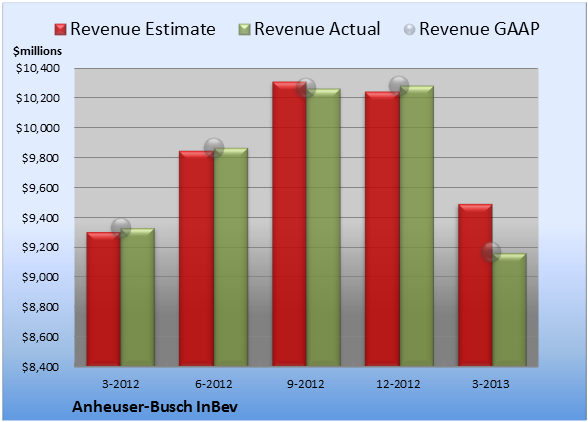 Anheuser-Busch InBev (NYS: BUD) reported earnings on April 30. Here are the numbers you need to know. For the quarter ended March 31 (Q1), Anheuser-Busch InBev missed estimates on revenues and crushed expectations on earnings per share. Compared to the prior-year quarter, revenue dropped slightly. Non-GAAP earnings per share increased. GAAP earnings per share grew significantly. Anheuser-Busch InBev chalked up revenue of $9.17 billion. The nine analysts polled by S&P Capital IQ expected a top line of $9.49 billion on the same basis. GAAP reported sales were the same as the prior-year quarter's. EPS came in at $1.16. The two earnings estimates compiled by S&P Capital IQ predicted $0.89 per share. Non-GAAP EPS of $1.16 for Q1 were 10% higher than the prior-year quarter's $1.05 per share. GAAP EPS of $1.28 for Q1 were 21% higher than the prior-year quarter's $1.06 per share.  Next quarter's average estimate for revenue is $10.30 billion. On the bottom line, the average EPS estimate is $1.13. Next year's average estimate for revenue is $45.48 billion. The average EPS estimate is $4.86. The stock has a three-star rating (out of five) at Motley Fool CAPS, with 276 members out of 300 rating the stock outperform, and 24 members rating it underperform. Among 80 CAPS All-Star picks (recommendations by the highest-ranked CAPS members), 75 give Anheuser-Busch InBev a green thumbs-up, and five give it a red thumbs-down. Of Wall Street recommendations tracked by S&P Capital IQ, the average opinion on Anheuser-Busch InBev is outperform, with an average price target of $104.94. Is Anheuser-Busch InBev the best beverage bet for you? Learn how to maximize your investment income and "Secure Your Future With 9 Rock-Solid Dividend Stocks," including one above-average beverage seller. Click here for instant access to this free report. Add Anheuser-Busch InBev to My Watchlist. 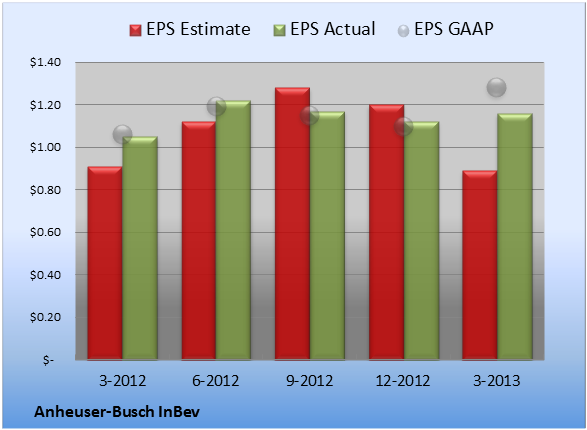 The article Anheuser-Busch InBev Crushes Earnings Estimates originally appeared on Fool.com.